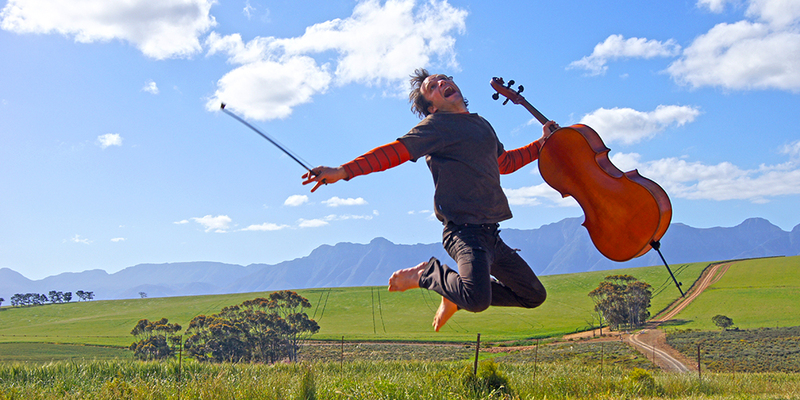 There was music in the air at Greg Lawson Galleries when they welcomed Francois le Roux, South Africa’s unique composer, spontaneous performer and music artist, known the world over as the Ha!Man, on Thursday November 3, 2016 at 7:00 pm. Accompanying le Roux was Belgian actress and word artist Joke (yoo-ke) Debaere and together they brought their mesmerizing “Ha! Show” to Sedona for only one performance during their 2016 North American tour. 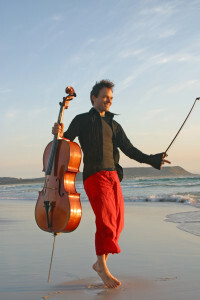 An accomplished cellist, the music of Le Roux has a classical grounding, infused by an array of styles including African. It is enthusiastically received by a wide spectrum of audiences across Southern Africa, Europe, North America, and the Far East. Le Roux was only four years old when his musical father stimulated his discovery for the piano and for improvisation. At age five his mother, a formal pianist, wrote down his first pieces. During his school and college years he studied composition, piano and cello, but in the 1990s left the formal environment to concentrate on completely improvised solo performances with cello, piano and organ. 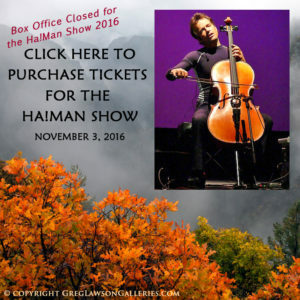 Since 2000 his current format developed: composing music by recording improvised sound-layers, mostly to accompany his cello in the Ha!Show. Le Roux has recorded soundtracks for numerous stage productions, film work and poetry performances. 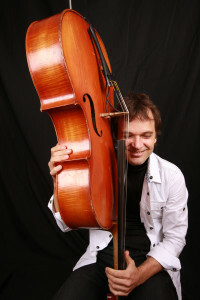 Some of his songs have been arranged for choir and orchestra, like “Her Time Has Come” (for Africa) and a number of formal composition commissions including “CeeDee” for cello and bass duo. Artist and Ha!Show performer Joke Debaere has regularly performed on stage in Belgium and the Netherlands. She wrote theatre pieces for her independent theatre company ‘Het Zesde Bedrijf’ following her education at the Theatre Academy of Maastricht in the Netherlands. She has published three English and four Dutch poetry books, one Dutch book with travel stories and five CDs with her poetry and the music of Francois le Roux. Debaere’s graphic art has exhibited in galleries in Antwerp, Belgium. Since 2012 Debaere has joined le Roux as a word artist performing in Flemish, English and French on stages in Europe, the USA, and South Africa. “The Ha!Show becomes a journey, broadly starting out slow and soft, going into high energy and challenging sounds, culminating in more home-coming and connecting items, by which time interaction with the audience might have grown – sometimes even towards everyone joining into song or dance,” says le Roux. Together le Roux and Debaere capture moments in sound and words that emanate from and reach the human mind and heart in new and often deep ways. 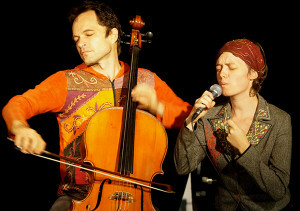 Their performances take the audience on a multi-artistic journey through a full range of emotions and musical styles. This not-to-be-missed show entertained and delighted the audience with sights and sounds for one night only in Sedona. The arrival of the Ha!Show to Greg Lawson Galleries followed the release of a collaborative project by le Roux and Lawson titled “Music in the Air” produced in association with and for the benefit of The Principle Movement. Those with advance reservations received a complimentary copy of the “Music in the Air” DVD (a $20 value). This sight and sound presentation combines the Ha!Man’s music with global images produced by Greg Lawson. Greg Lawson Galleries is located at 2679 West State Route 89A on the south side of Harmony Drive intersection.